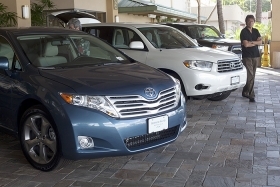 A visitor walks by Toyota vehicles Tuesday at the Servco Toyota Hawaii Dealership in Honolulu, Hawaii. Toyota's U.S. sales fell 34 percent in August and are down 1 percent for the year to date. U.S. Car and Light-Truck Sales, Aug.
U.S. auto sales dropped to their weakest rate since February as most automakers posted sharp declines from a year earlier, when the U.S. cash-for-clunkers program fueled demand for new vehicles. August's seasonally adjusted annual sales rate of 10.8 million units fell from 11.6 million in July and was well below analysts' forecasts, according to the Automotive News Data Center. Bloomberg News and Autodata Corp. separately pegged the August SAAR at about 11.5 million units. After August sales tumbled 21 percent, industry sales are now up just 8 percent from 2009 levels, when demand hit a 27-year low. Ford Motor Co.'s August sales dropped 14 percent from a year ago -- when the ‘clunkers' program boosted sales 17 percent. General Motors Co. posted a 25 percent decline. While most automakers benefited from the ‘clunkers' program, GM suffered a 20 percent sales decline in August 2009 -- its first full month after exiting bankruptcy. The cash-for-clunker program provided government cash incentives of $3,500 or $4,500 for consumers who traded in an older car or truck for a more fuel-efficient vehicle. The federal incentives helped U.S. auto sales end a 21-month skid in August 2009, rising a modest 1 percent above August 2008. At Toyota Motor Corp., which racked up big sales numbers as a result of the ‘clunkers' program, August sales plunged 34 percent. The automaker's year-to-date sales are now off 1 percent. Honda Motor Co., Nissan Motor Corp. and Hyundai Motor Corp. also posted sharply lower August sales after receiving a lift from ‘clunkers' a year earlier. Chrysler Group, which did not benefit as much from the ‘clunkers' program and relies more on orders from fleet customers, said August sales rose 7 percent -- its fifth consecutive monthly sales gain. Mercedes-Benz parent Daimler AG's August sales also advanced 7 percent. But at Subaru, sales dropped 23 percent last month -- its first decline since May 2009. The company had soared 52 percent a year earlier. Because of the difficult comparison to a year ago, automakers and analysts are comparing August sales to July demand to measure the industry's health amid weak economic growth and the nation's high jobless rate. GM's August sales were down 7.3 percent when compared with July 2010. Ford's August sales were off 7.6 percent from the previous month. Toyota's sales declined 12 percent in August versus July. At Ford, overall car demand dropped 14 percent and SUV and crossover sales fell 26 percent. At the Ford division, sales fell 11 percent, with demand for the Focus compact off 40 percent from a year ago, when ‘clunkers' fueled sales of fuel-efficient models. Mercury – which Ford is dropping by the end of the year – posted a 23 percent sales dip. GM said combined August sales of Buick, Cadillac and GMC rose 37 percent from a year earlier, while Chevrolet posted a 22 percent decline. The automaker's sales to retail customers fell 29 percent in August, while sales to fleet and rental customers dropped 12 percent. While retail sales of Chevrolet's full-size trucks and SUVs rose 8 percent last month, demand for some of division's other top-sellers -- the Impala, Cobalt, Equinox, Traverse and Camaro -- fell sharply from August 2009 levels, GM said. Chevrolet couldn't match August 2009 -- when sales were aided by the clunkers program. Chevrolet said the program boosted sales by 86,000 units, with most of those coming during the August portion of the incentive. Additionally, Chevrolet's 3,000 dealers have low inventories of the Cobalt compact as the division prepares to introduce a new compact -- the Cruze - in late September. Cadillac sales increased 83 percent for the month, and Buick saw a 66 percent gain. GMC was up 12 percent. Analysts had projected a SAAR of 11.6 million, according to the average of eight estimates compiled by Bloomberg. That would have been the year's third-highest rate. J.D. Power and Associates said late yesterday that the pace of sales to individual customers “slowed considerably” in the last week of August. It had pegged the August SAAR at 11.4 million. Consumers are avoiding showrooms as fear of a double-dip recession grows following the 27 percent plunge in existing home sales in July, said Mike Wall, an analyst for IHS Automotive. The U.S. unemployment rate in July held at 9.5 percent, near a 26-year high of 10.1 percent. “When you've got that sentiment, that fear hanging over the market, it makes it a tough sell for consumers” to spend $25,000 or more on a vehicle, said Wall. Automakers also have a tighter hold on inventories and don't feel compelled to pile on discounts to spur sales. GM said its dealer stockpiles stood at 452,000 units at the end of August -- about 73,000 units higher than August 2009. In the fourth quarter of 2010, Ford plans to produce 570,000 vehicles -- down from 574,000 in the fourth quarter of 2009. During the third quarter, Ford will build 570,000 vehicles, unchanged from previous plans. “The Ford plan is to match capacity with real demand, and we continue to monitor the key economic indicators as we make adjustments,” said Ken Czubay, Ford's head of U.S. marketing, sales and service. David Barkholz and Bloomberg News contributed to this report.